A step-by-step video recipe for Dal Fry. A deliciously satisfying dal / lentil stew preparation that is a staple in any Indian household. The kind of dal I had growing up was very different from this kind of dal that is more prominent in the Northern part of the country. The dal Amma made was usually the koottu kind with ground coconut added to it with different vegetables or sambar. Anything a little different from that was a simple tadka dal, that I would like to call a South Indian tadka dal with mustard seeds, curry leaves, dried red chillies and asafoetida in the tempered seasoning. Tadka is the generic term for any kind of tempered seasoning that is added to Indian curries. I learned the nuances of the different kinds of dal later in life when I started cooking more and wanted to replicate a lot of goodies we ate out at restaurants. This dal fry recipe is very similar to your tadka dal, the only difference being that the onions and tomatoes are a part of the tadka and the dal is a lot thicker. In tadka dal you cook the onions and tomatoes with the dal and then a simpler tadka / tempered seasoning of just cumin is added to it and sometimes some cayenne too. Those nuances really vary from region to region and person to person. Here is the printable recipe and a step by step video of Dal Fry recipe. Wash the dal well and cook in 2 cups of water. Check for doneness and add more water incrementally. Otherwise, the dal will foam up and overflow if kept on high heat. In a small kadhai or deep skillet, heat the oil and add the cumin to it. Once the cumin starts browning, add the ginger, garlic and onions. Saute till the onions start to soften and then add the asafoetida and the green chillies. Once the onions are translucent and starting to brown, add the tomatoes and let the tomatoes cook down. Check for dal – it should be mushy. Mash it with the back of the ladle and add the onion- tomato mixture to it. Mix well and garnish with cilantro. It is a lot more efficient to use a pressure cooker to cook the dal, that dal will get mushy and nice in about 15 mins instead of the 40 mins or so in a saucepan. Thanks girl! Yeah, working on more videos. ? 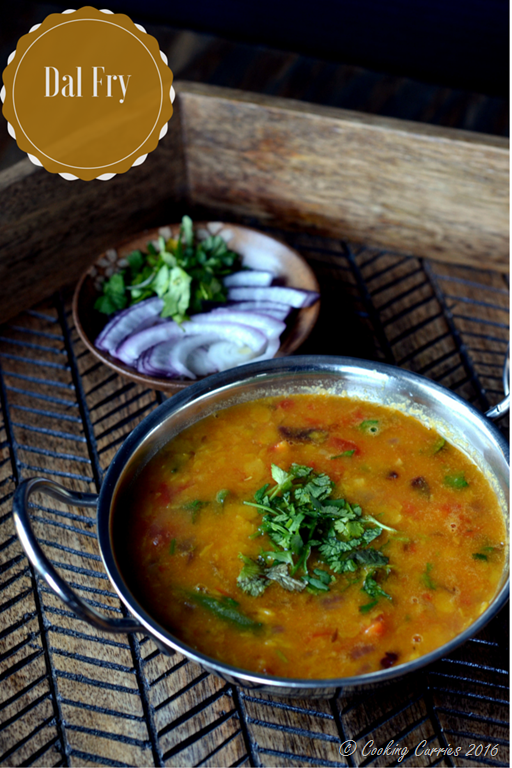 I make a similar version of this dhal! It’s my favorite dish.. your recipe sounds yummy too! Ooo excellent, I love cooking Indian inspired food but have yet to perfect a good Dal dish, gotta give this a go. I have a lot of dal in the pantry. Love finding something different to do with it. I just love the flavors of India. I am so glad you are part of this group so I can see so many different recipe ideas. This looks delicious. I absolutely love Indian cuisine and this looks so delicious. I find the colors so appetizing and inviting. I’m always looking for good lentil recipes to try. Thanks for sharing this, it sounds delicious! I want to eat everything on your blog. I LOVE Indian food and will be trying many of your vegetarian recipes. Thanks. Great photos, too. Thank you so very much Erin! ?